William J. Satzer at the Mathematical Association of America reviewed Uncertainty: The Soul of Modeling, Probability & Statistics. Here it is (ellipsis below original). Verified probability models should be used only predictively. Many experts in probability and statistics could probably find interpretations of several of these statements with which they would agree…up to a point. It is apparent that hypothesis testing is widely misused, and that “p-hacking” has become a serious concern. 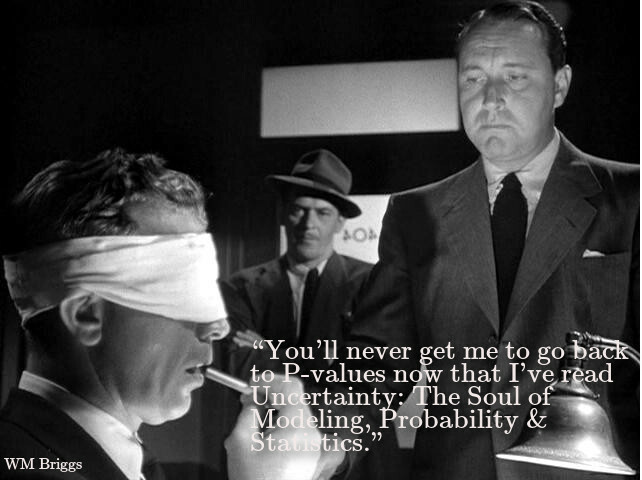 Some journals will now not accept papers that use p-values. Will we therefore abandon hypothesis testing all together? This is not the work of a crank. The author has a PhD in statistics; he teaches and works as a statistician. He supports his arguments with clear and careful reasoning presented very deftly. Whether his arguments are convincing is another matter altogether. It is far easier to agree with the author that the interpretation, presentation and communication of statistical results are often highly flawed, and that over-certainty is rampant. The outline of the author’s argument is, as he suggests, seen most clearly in four chapters in the middle of the book: “Chance and Randomness”, “Causality”, “Probability Models” and “Statistical Models”. The preceding five chapters develop the background on which these are based. The author’s intellectual heroes include Aristotle and Thomas Aquinas, so it’s no surprise that these foundational chapters go back to classical considerations of truth, logic, metaphysics and realism, and the nature of causality. This book is worth a look by anyone who teaches probability and statistics. If the arguments themselves don’t prove convincing, the cautionary tales that are included are well worth the time. Very fair review. Yours Truly is not a crank, but he can be cranky. And I only hoped, but did not expect, most of my ideas would be convincing. For those steeped in the classical statistics, there is too much to give up, too much that is new. Yet as I say, all is old. It is the new ways, the classical statistics, that were introduced since circa 1900 that are the problem. Out with the new and in the old! You don’t want to abandon the testing of hypotheses; only the statistical methods that give instantaneous but over-certain evaluations of their accuracy. Actually, we can’t abandon hypothesis testing. We do it multiple times a day, mostly unaware. I hypothesize my car with its five-year-old battery will start on this very cold morning, for example. Don’t need a p-value for that … but may need jumper cables. Your perspective has been both refreshing and educational. You bring reason into modelling that math on its own lacks. Happy 2017. From the introduction and preface, it seems it might just answer questions I asked about statistics 40 years ago. Are there sections of the book that operationalize your statistical/probabilistic worldview? I mean to ask: are there prescriptions, analytical methods, things-to-do, and tools provided, or would you say that the focus is rather more cautionary and the tool, method, etc. recommendations are more along the lines of “don’t use, don’t do, avoid…” and the like? And another question (if I can get a two-fer) to what extent would you say your Uncertainty approach of to a given stat/prob project would overlap or resonate with that of the Incerto of that other very outspoken fellow, NN Taleb? I’m quite unsatisfied with this review by Satzer. While there is nothing unfair in his evaluation of topics covered in the book or noting your Not-Shy-Compared-To-Other-Statisticians prose, he doesn’t get to the meaty part of the intellectual questions raised in the book. He never says why the arguments are not convincing, where the main grounds of disagreement are or who to read to find an alternative account of the matters addressed. He doesn’t even perform the basic reviewers task of situating the book in any context, apart from reminding us that hypothesis testing is in a bit of a epistemological pickle (to which no alternative resolution is suggested to us by the reviewer). Previous Previous post: Merry Federally Recognized Holiday of 2016!